8mm Lebel ammo is a name applied to both a revolver cartridge and a rifle cartridge. This revolver round was utilized in the First World War, mostly by French Officers. The 8 x 27 mm cartridge is quite small and comparable to a 32 ACP in terms of power. The round was quite when fired from the high quality Lebel revolver. While the round lacks much power it was utilized for a number of years by the French Army, Navy, and National Police forces. The 8mm Lebel is still a favorite among collector’s of World War one weapons, and turn of the century revolvers. The 8mm Lebel was one of the last few revolvers cartridges to see military use. The 8mm Lebel is still enjoyed immensely by shooters who appreciate the fine quality weapon and well designed ammunition. The 8mm Lebel is still in production to please collectors and enthusiasts across the world. A new Lebel shooter should be very careful to insure they are purchasing the proper ammunition for their revolver, since both the rifle and revolver round are expensive. Looks great shoots great. Glad you had it in Stock. Wish I was able to get it more often. Haven't used it yet but it all looks good. 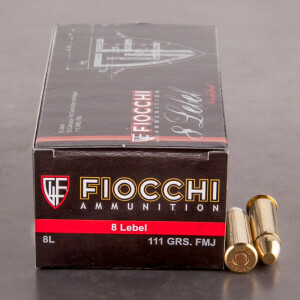 This particular ammo is seldom produced so you have to grab it when you see it. I grabbed 6 boxes to give me plenty of brass for reloading after firing. Graf's has the bullets, but as far as I know, this is the only 8mm Lebel revolver manufactured brass.